Wide Eyed Editions, 9781847807113, 112pp. In 51 charmingly illustrated infographic maps, explore every state of the USA from Alabama to Wyoming and the nation’s capital to discover more than 2,000 facts that celebrate the people, cities, nature, and historic events that have helped make America what it is today. You'll also get an expansive guide to the state flags and US presidents. Ghost towns, swamp tours, the center of the universe…bacon donuts, brainy berries, salmon jerky…The French Fry King, The Mother of Oregon, The Queen of Blues…be inspired by the inventiveness, beauty, and diversity of the United States in this curious collection of fact-filled maps. Each state’s map also contains information about which states it neighbors, its bodies of water and borders, as well as where it is situated in the country. Did you know that while Hawaii shares its border with no one, both Missouri and Tennessee border eight other states? Many state parks, battlefields, national forests, and reservations are also included to inspire you to respect and explore the great outdoors. So pack your bags and say later ‘gator…the great States await! Author Gabrielle Balkan has written over 20 books for children, including the Mr. President series for Scholastic. She lives and works in New York. Illustrator Sol Linero lives and works in Buenos Aires, Argentina. Her clients include Scholastic, Oprah magazine, Jamie Oliver magazine, and Wired. "A big, beautiful educational journey across the U.S."
"When I first laid eyes on The 50 States, written and researched by Gabrielle Balkan and illustrated by Sol Linero, I absolutely had to have it because I think it's easily the most delightful book on the topic that I've ever seen." "There are Tlingit nation canoes in Alaska, Walden Pond in Massachusetts, Harpers Ferry in West Virginia (but also the first pepperoni roll and first red-brick street; not all icons are serious business)." "The engaging, colorful pages, high interest facts, and intriguing material make this a volume that has appeal for a wide audience." "Surprises abound in The 50 States, a splendid reference, coffee-table book and conversation starter for anyone, anywhere." "Readers will enjoy browsing this oversized and colorful atlas of the United States....will offer hours of browsing pleasure." "Open the large formatted book and explore the United States. Each state (and the District of Columbia) is presented handsome, colorful, and highly informative maps to create a memorable journey." "For Those Who Pride Themselves on Knowing Their State's Flower/Bird/Motto. A large-format atlas of the U.S., The 50 States is chock-full of interesting facts, trivia and history." "Author Gabrielle Balkan's research and writing draws readers in with a fun mash-up of history, geography and pop culture, while Sol Linero's illustrations make every spread a delight." "A stylish atlas that evokes the character and diversity of the country, equally suitable for coffee tables or family vacations." "A great read to share with your young one. Bright and colorful, you'll enjoy it as much as they will!" 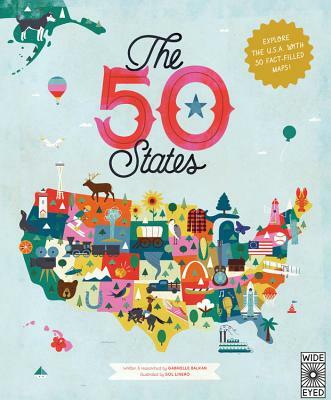 "A colorful introduction to the 50 states....an above-average title on a popular topic, and state trivia enthusiasts will find it entertaining and useful." -"